This is exciting. Just a couple of weeks into the new year and there’s a première in Köln of the newest piece made by Swiss German-language theatre director extraordinaire Christoph Marthaler. As regular readers will know, I came pretty late to this party, first seeing anything he’d done with Meine Faire Dame at the EIF last summer. Since then I also caught his previous latest, Glaube, Liebe, Hoffnung, in Berlin, which I didn’t go quite so crazy for, but still admired. Perhaps more exciting in the event here was the fact that Oh It’s Like Home is also a piece of German new writing. Thinking about it, I’ve seen remarkably few new plays in Germany. Indeed, I think I’ve seen more German première productions of new English plays than I have of German ones. I think it’s fair to say that Germany doesn’t have quite the same sustained concept of a New Writing Industry. There are advantages and disadvantages to this. One interesting aspect is how much of the work that is generally apportioned to the writer in Britain gets undertaken as a matter of course by directors. A couple of summers ago a director friend was asked to do a stage version of Thomas Mann’s The Magic Mountain. Which is a novel, not a play. The director in question read the book and put the text that she was going to use on stage together before going into rehearsals. 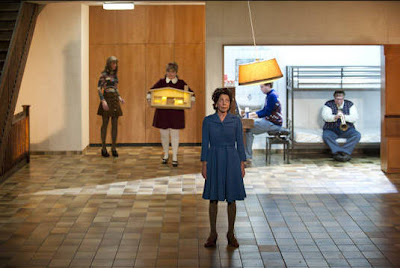 Similarly, that Kriegenburg stage version of Kafka’s Der Prozess that I saw in Prague all those years ago with the incredible set didn’t have a writer credit and was just the director’s cut of the novel plonked on stage and then made magical. It’s a comment, which I don’t think I subscribe to one bit, but I do think it’s an interesting reflection of how we might be encouraged to think about theatre in Britain – certainly here by one of our leading critics, it seems. I definitely had to ponder a bit about why I was so amused by the fact that Marthaler seems to have a particular aesthetic that he’s exploring. If these three productions are entirely representative of the direction that Marthaler’s work is currently taking, then I think I could imagine, for example, the Marthaler production of Duncan Macmillan’s Lungs (which I think might well have been my favourite bit of New Writing last year. Certainly my favourite bit that I didn’t mention in my end-of-year round-up of best-ofs, which is interesting...), for example. On the other hand, in spite of what what we might see as inevitabilities, I think it would be an incredibly rich production. There is, after all, just the sheer fact of the materials that are meeting, for example. 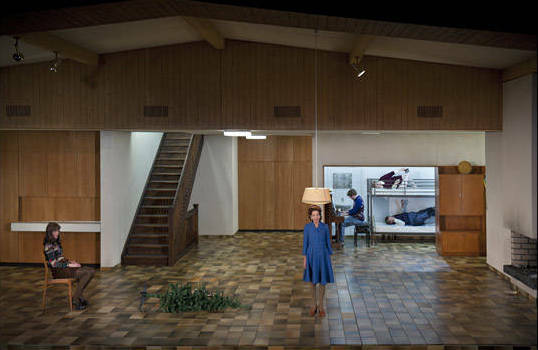 Oh It’s Like Home *the production* might look a bit like Glaube, Liebe, Hoffnung – or indeed Marthaler’s putative production of Lungs – but I don’t think the three plays could be more different. I suppose in part, my really picking up on Marthaler’s aesthetic might also be to do with our age difference. The interiors of Marthaler’s sets (Anna Viebrock in Basel and Berlin, here Duri Bischoff) evoke a very specific time period and location. The rebuilt mainland Europe of the 1950s and ‘60s, and this is no different, the interior of a (typically Swiss?) modern wooden walled cabin. Perhaps to others, Rupert Goold’s settings, which all look totally, readably different to me, all meld into a generalised blur to do with our generation, while Marthaler’s are all deeply, significantly different. Marthaler’s aesthetic also runs the risk of seeming kitsch, and I think would be were it not for its astringency, the care put into it, and the fact that it does genuinely seem to open up both worlds for exploration. The characters don’t speak to each other, their stories are not inter-related, they are four monologues describing four separate existences in four quite disparate rooms. Egon Richter (Josef Ostendorf) talks about growing up in an orphanage, Hanna Lendi (Bettina Stucky) in a slaughterhouse, Ilse Schafleitner (Silvia Fenz – far and away the most watchable of the three women, a cross between Frances De La Tour and Kathryn Hunter) on some room in East Germany and Gunda Krass (played by Sasha Rau herself) talking about dead butterflies and making surprising Tourettesy outbursts of “Ficken, Ficken, Ficken” at occasional intervals. There is plenty of wry humour in the piece – in the writing – but there is much more in Marthaler’s gentle but mischievous setting of it. Both Ostendorf and Stucky are quite notably overweight actors and there is a certain extent to which this is capitalised upon. Not cruelly, so much as sympathetically and absurdly. At one point Ostendorf – who physically resembles an older, beardless Daniel Kitson – is revealed sitting in a cupboard with a small girl’s dress hanging next to him; on another occasion he sits in the hidden back room with the pianist mournfully blowing into an absurd trumpet-like instrument. On one occasion Stucky climbs over Ostendorf into the bunk bed, on another occasion they are revealed in the kitchen with a reveal that suggests they have just eaten all the cakes... By contrast, Fenz is all spryness and regretful faraway looks, at one point disappearing into the chimney stack to continue reading her book. Rau’s play itself I would love to read it English. Apparently the production came about because Rau has worked with Marthaler as an actress and said he would like to direct something she wrote. This production is funded by the KunstSalon-Autorenpreis für das Schauspiel Köln 2012, which I presume means Rau won a writing competition. Whether her winning it was influenced by who she had attached as a directorial name, I don’t know. It seemed a nice, competent, interesting-enough piece, but perhaps not an out-and-out classic of postdramatic literature. I would also be very interested to see how a British director instinctively handled it – trying to let the “text speak for itself” (given that as four monologues, it can’t be “served” per se). The usual solution in the first instance often seems to be the four speakers sat on chairs, route; as exemplified by Vicky Featherstone’s première of Crave (fwiw, Ostermeier’s version is only a bit more jazzy). So, what to conclude. With my language-understand tied more firmly behind my back than some other times – I could get the gist, but no real impact; although this might be because there wasn’t much impact. Apparently it was quite surreal in German too. There were a surprising number of walk-outs – the main pleasures here were the absurdist visual comedy and more rather gorgeously realised music (by, among others: Max Bruch, Anton Bruckner, John Cage, Frédéric Chopin, Scott Joplin, Eric Satie and Richard Wagner). The review and critical round-up at Nachtkritik seems to concur, albeit it rather admirably more high-flown language.